Once he had the crowd’s attention, but before showing them how to make something delicious, Little Chef DJ played a trivia game. What vegetable starts with the letter z? Which is healthier: fruit juice or water with fruit in it? How can you tell the difference between a fruit and a vegetable? Over three years at the St. Louis Kids Expo, nobody ever gave three correct answers. The blank stares and wrong guesses underscored the reasons DeEsten Lewis Jr. – aka, Little Chef DJ – was there. It’s not just that folks in his community don’t know how to cook healthy meals. Many don’t even know what it means to eat healthy. Tiarra Lewis, DJ’s mom, is well aware of this. She learned the connection between what you eat and how you feel only a few years ago. It happened during nursing school. A lesson about nutrition prompted what she calls “an epiphany” – about her mother’s premature death, her own wayward diet and the chance to break that cycle for her children. Just three years later, her oldest son is spreading the gospel to the masses. 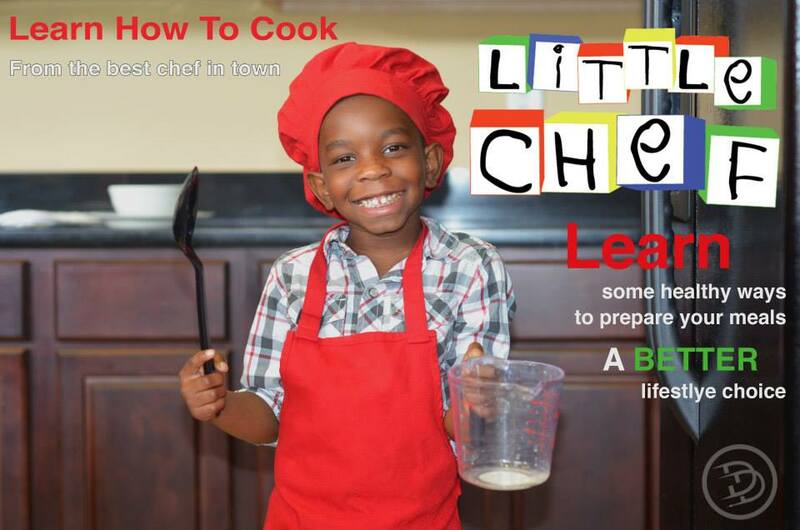 With his adorable smile, catchy nickname and legit culinary skills, 8-year-old Little Chef DJ is informing and inspiring everyone he can. November is Eat Smart Month and Wednesday is Eat Smart Day, making this the perfect time to share the story of Tiarra and DJ Lewis. But first, let’s see how you did on his trivia quiz. The answers are: zucchini, water with fruit in it and fruits have seeds. Her mom went on to become a surgical technician and traveling nurse, and her dad took a job in a casino, working his way up to a supervisor. In their busy lives, everyone ate whatever, whenever. The only fruits Tiarra knew were apples, oranges, bananas and strawberries. She never saw an avocado, never ate spinach. The closest thing to a cooking lesson was watching her grandfather make bacon and eggs. “He was just hungry and wanted something to eat,” she said. Similar motivation prompted Tiarra to figure out how to make a few dishes after marrying DeEsten Lewis Sr.
She settled into a routine of fried chicken and spaghetti on Mondays, tacos on Tuesdays and fried fish on Fridays. The rest of the week usually included fast food or heat-and-eat items like frozen pizza and ramen noodles. Tiarra was a teenager when her mom started getting sick. Tiarra took her mom to some doctor’s appointments but was told to stay in the waiting room. So she never grasped how sick her mom was before a heart attack took her life. Tiarra was 19 when she lost her mom. Now jump ahead to age 27. Tiarra was in nursing school, her busy lifestyle prompting her to snack on bags of sunflower seeds washed by a giant orange slushy. She often picked up fast-food meals for DJ. Then the teacher began lecturing about nutrition and everything clicked. The same teacher showed the class how to make a yogurt parfait. Tiarra found it simple, fun and delicious. Days later, she brought home vanilla yogurt, granola, strawberries and a fruit she’d never seen: kiwi. She made it with DJ and he loved everything about it, from tasting his creation to the “big boy” feeling of working in the kitchen with mom. He wanted to do more. OK, she said, but only if he followed their new rule. In 2015, DJ made a pineapple upside down cake for his younger cousin’s birthday. Tiarra took a 9-second video of DJ showing off his creation while wearing a red chef’s hat and matching apron. It was so cute, she posted it on Facebook. Someone at a local TV station saw that video and invited DJ to appear on a cooking show. His debut at the St. Louis Kids Expo followed. Then he became connected with my organization, the American Heart Association. He picked up the nickname “Little Chef DJ” along the way. Eventually, he got his own logo. And theme song. “People call him a celebrity, but he doesn’t look at it like that,” Tiarra said. Last year, they connected with Keith Tucker, founder of Hip Hop is Green, an organization that uses music to introduce vegan foods to people in urban communities, especially youngsters. Tucker invited the Lewis family to California, where they enjoyed eating vegetables plucked from a garden and lemons, limes and other fruits dangling off trees. “That’s stuff you don’t see in St. Louis,” Tiarra said. And she thought: We should. Ever since, Tiarra has been seeking money and land to create a garden in her low-income community. It’s especially needed because the neighborhood is a “food desert,” the term for places lacking fresh fruits and vegetables. DJ is a typical 8-year-old in the sense that he loves playing Minecraft and running around with his friends. Having outgrown dinosaurs, his new interest is science, especially chemicals and elements. Still, his life revolves around the kitchen. He and Tiarra scan the internet for recipes and watch cooking shows. He’s up for anything involving fruits and vegetables. They also love learning about foreign cuisines; they’ve created all sorts of Mediterranean, Asian, Indian and Mexican favorites. They still occasionally have Taco Tuesdays, only now they include chicken topped with a homemade mango salsa, and probably DJ’s signature guacamole. Pasta is another favorite, especially a vegan macaroni-and-cheese dish. DJ dreams of owning a restaurant or launching a line of food products. Maybe he could sell “rabbit juice,” a drink made from carrots, pineapples and peaches. Their message about eating healthy is clear: It’s easy enough that kids can take the lead.